One of the preliminary designs for the roundabout. The exact alignment of the roundabout has yet to be finalized. WARSAW — It was announced that phase II of the CR 300N Project will be the major project going into 2019 for the Warsaw Redevelopment Commission. 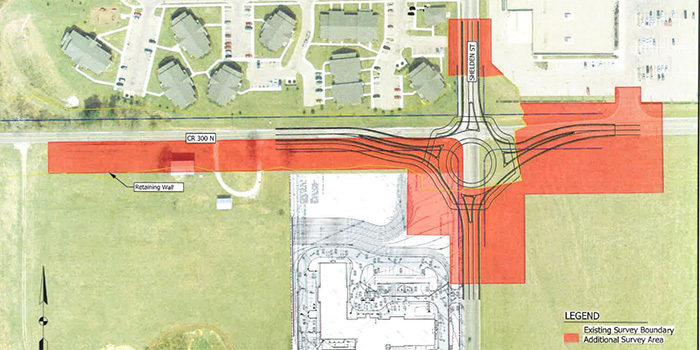 An engineering agreement for the project and its roundabout was presented at the meeting held yesterday, May 7. The scope of the project includes road reconstruction, a roundabout, curbs, sidepaths and streetlights. The hope is for engineering to be completed this year so that the project can begin in 2019. Other options looked at were flashing lights, stop lights or pedestrian stops. Due to the nearby residential, commercial and school areas, along with the limited line of site, it was determined a roundabout was the best option. It was noted that this roundabout would be a little bit larger than the husky trail roundabout. The total cost of the project is currently estimated at $2,500,000. An engineering agreement between the Troyer Group, Mishawaka, and the commission was presented. The agreement was tabled until the next meeting so that members could have more time to review the paperwork. An annual farm contract between the commission and Powell Farms was approved pending further updates. John Powell rents 53 acres of land in Plain Township for farming at $190 per acre. The contract has been delayed this year due to upcoming construction in the area. The commission approved the contract pending the identification of how many acres would be available for rent this year. Powell will then have the ability to rent the reduced number of acres if he so chooses. The next Warsaw Redevelopment Commission meeting will be held at 4 p.m. Monday, June 4.